Brand Name Versus Generic Yoga Mats -- Worth the Splurge? The Jade Harmony Professional Mat. The iconic Manduka Black Mat. "The Mat" by Lululemon. These are the top three contenders for what yoga teachers and devotees would consider the best yoga mats available on the market today. Why? One word: performance. All three of these mats are highly durable and long-lasting, they provide a grippy surface that is truly slip-free, and they all cost an arm and a leg. The question is, "are these mats worth the splurge?" The Jade Harmony Mat series ($62.95 to $116.95) comes in several different sizes and two colors: olive green and navy blue. 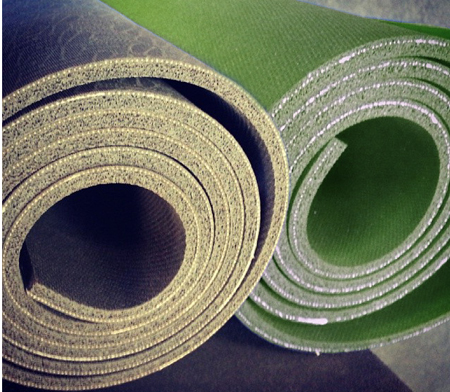 This mat is great for hot yoga because it is made from natural tree rubber, foaming agents and plastics that are all considered eco-friendly. Jade mats are open-cell, meaning they soak up body sweat and wick it away from the localized sweaty area. This makes the mat extremely grippy even in the sweatiest classes. In many instances, a hot yoga mat towel is not needed to supplement this mat because it is already supremely absorbent. Because these mats are open-cell, they periodically need to be deep cleaned to prevent foul odor and mildew. Yoga Accessories' Natural Rubber Yoga Mat ($49.99) is a practical alternative to a Jade Mat -- offering all of the bells and whistles that Jade Mats offer. Our Natural Rubber Mats come in olive green or a very cool and unique light brown-on-brown woodgrain pattern with a dark brown bottom. The brown option also has curved edges and a textured bottom side which helps it stay in place on the floor. If you look at these two mats side-by-side with a Jade Mat, you can see the similarities in material composition. They are both made from natural tree rubber as well as eco-approved foamers and BPE-free/toxin-free plasticizers. Also open cell, these mats are Bikram-approved and our customer reviews compare this mat to the Jade, most giving this mat five out of five stars! As you can see, here is our olive green natural rubber mat next to a Jade Harmony Mat. One costs around $100 and the other around $50. Which would you prefer? The Manduka Black Mat, recently re-named the Manduka Mat Pro ($100), is a durable and rigid performance-style mat. It is closed cell, so it does not absorb sweat and is easy to clean. It stays grippy, however, because of it's textured and fabric-like surface structure. The Manduka Mat is thick, heavy, and rigid -- made from man made materials. Yoga Accessories has a viable alternative to the Black Mat Pro: The Premium Weight Yoga Mat ($39.99). Our Premium Weight Mat is just as dense and rigid as it's competition. The bottom side is smooth and sticky. The top side is textured and made from skidless plastics and foamers so slippery hands and feet stay put. Weighing in at over 5 lbs, this heavyweight contender is available in original black, royal blue, and aqua. Lululemon's series of almost pretentiously-named "Mat" line includes a series of extra thick (The "Big" Mat/$88) to foldable-thin (The "Un" Mat/$48) yoga mats that are all closed cell and only slightly textured on both sides. They seem to be made up of a magical material that makes these makes mats that would presumably be super slippery the exact opposite: exceedingly slip-free. The "magic" would be in the composition: polyurethane outer coating, latex, and rubber. All of these mats are advertised as an optimal mat for any style of yoga -- even Bikram. If you are a minimalist who doesn't enjoy lugging around 8 pound mats every time you hit the studio, you will appreciate our Travel Mat ($12.99). Like Lulu's "Un" Mat, our Travel Yoga Mat is less than 2 mm thick and weighs only one pound! Plus, our foldable mat is latex-free. You will enjoy using this mat on-the-go or even in everyday practice; just throw it over a borrowed mat from the studio! This is my favorite mat for everyday use outside my home. It folds easily in the back seat pocket of my car. The travel mat folds into a suitcase-friendly flat square (2.5"H by 12"W by 9"L). Choose from our original black or azure blue. At $13, this mat is a steal! Have you found an affordable solution to big name brand yoga mats? Let us know which Yoga Accessories product you prefer over the branded, over-priced yoga mat! Check these out for yourself! Is Wrist Pain Affecting Your Practice?